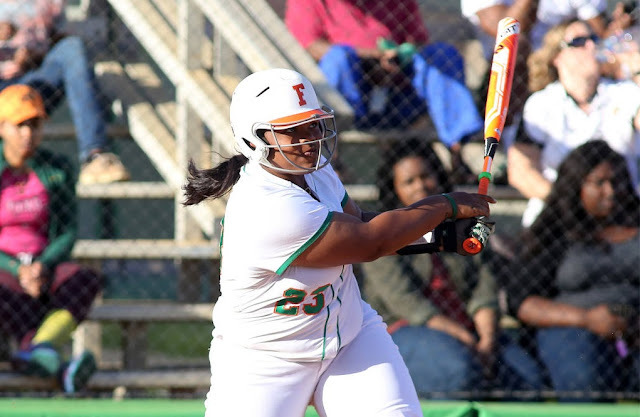 The Mid-Eastern Athletic Conference (MEAC) announced its 2018 Preseason All-Star Softball team Thursday morning, and three FAMU players were tabbed as first-team selections. Senior first baseman Toni Anderson, junior outfielder Alexis Day, and sophomore shortstop Jamesia Stoudemire were the FAMU trio honored Thursday. Anderson, a 5-10 power hitter from Dothan, Ala., was a first team All-Meac selection in 2017, after hitting .298 in 51 games, with 12 home runs, six doubles, one triple and 30 RBIs. She finished with 39 hits, 22 runs scored and a team-best .634 slugging percentage. Day, a 5-9 performer from Ocala, Fla., was the team’s leading hitter among regulars, with a .325 batting average in 55 games in right field. She led the team in hits (52), and was second in slugging percentage at .506, after lashing seven doubles, five triples, and four home runs, driving in 29 runs. She was an All-MEAC team selection in 2017, and was also a member of the MEAC Softball All-Academic team. Stoudemire, a 5-9 phenom from Lake Wales, Fla., one of the FAMU recruiting hotbeds, had a dazzling freshman campaign in 2017, hitting .294 in 56 games, leading the team in runs scored (40), while tying Alexis Day for the club lead in hits (52). She led FAMU in total bases with 88, after hitting nine doubles, six triples and five home runs, tying Day for second on the team in RBI with 29. The Famu Softball team, winner of four straight MEAC titles, and 13 in the last 26 seasons, were picked to win the Southern Division of the MEAC, followed by archrival Bethune-Cookman.